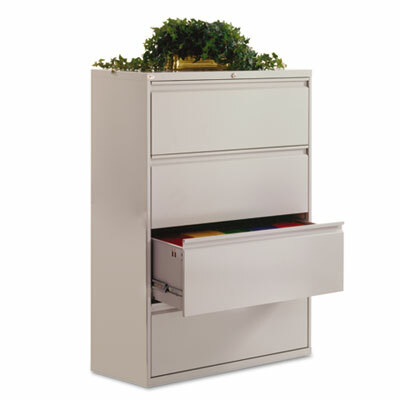 19 1/4" deep drawers with side-to-side hang rails to accommodate letter/legal hanging files. Full drawer extension on steel ball bearing telescoping slide suspension. Reinforced double-wall drawer fronts provide extra stability. Stylish full-width recessed pulls. Anti-tipping interlock system allows only one drawer to open at a time. Single key core removable lock with two keys. Four adjustable leveling glides. Durable powder coated finish helps prevent scratches.